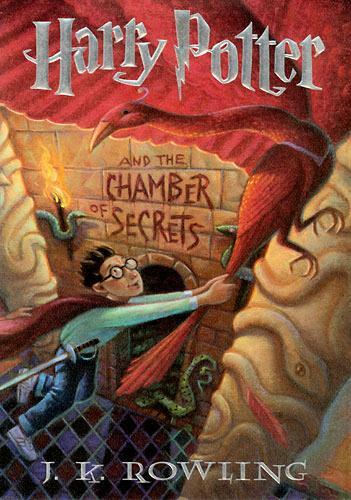 Although it’s the second book in the series, Chamber of Secrets was actually my first experience reading Harry Potter. Fifteen years ago I was 18 years old and attended a birthday party for one of my older sister’s college friends. Everyone spent the night at the friend’s house and in the morning I woke up first. Too timid to wander the house on my own, I looked around the room for something to kill time until everyone else woke up. Lo! and behold, there was a copy of Chamber of Secrets on the night table. I got so engrossed that I was a hundred pages in before I realized everyone else had long since woken up and been bumping about the kitchen. I had to force myself to put the book down to rejoin the group, and the first opportunity I had I ran to a book store and purchased the three Harry Potter books that were available then (Goblet of Fire was five or six months away from publication at the time). So while Sorcerer’s Stone was the first full Harry Potter book I read, my journey actually began here, in the Chamber of Secrets. Revisiting the book for the first time in several years, I was curious to see if my memory of the film adaptation (which I consider to be very shoddy) had colored my memory of the book. The answer is that it both had and hadn’t. For the first hundred pages Chamber is about as plotless as Sorcerer’s Stone was, and the plot makes about as little sense. 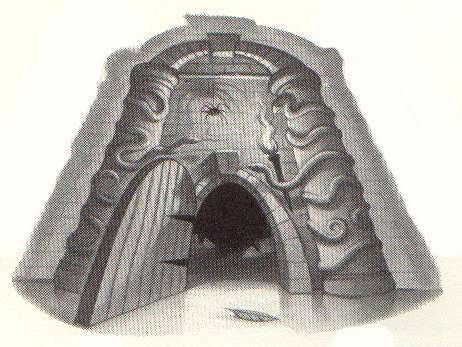 But once the Chamber of Secrets has been opened, Rowling begins to considerably darken things up and focus. It becomes quite clear that the world Harry Potter lives in isn’t all wizard candy and quidditch; this is a world that is crackling with danger. The problem? We’re still skewing too young to let that darkness loose. The plot basically contorts and twists to the point of ludicrousness in order to not kill any of the students at Hogwarts because having a death toll at this early stage would cancel any credibility as a children’s series. Instead we get a bunch of petrified students and one petrified cat–plus one petrified ghost, despite the fact that even Rowling never attempts to explain how a ghost came to be petrified (the only possible reason is he fell into a gaping plot hole that allowed a student to be petrified by the basilisk’s gaze instead of killed, then the ghost had to be taken out of the plot somehow so no one would know that a basilisk was behind all the attacks until Harry put two and two together before the grand finale). The first hundred pages are also problematic. Yes, they follow the same structure as the first book, which I gave a pass for being mostly a children’s book and for doing a lot of the world-building. But the whole set-up where Dobby attempts to warn Harry Potter not to return to school? Does not compute now that I’m older and less willing to just go with the flow. Because let’s face it, how could the Ministry of Magic be fooled that Dobby’s magic levitation spell was performed by Harry Potter? We’re led to believe that the mere fact that magic was performed in the Dursley house was what tipped them off, but what if Harry didn’t live with Muggles? What if, like Ron, he lived in a house with wizard parents? If acts of magic within a household are the only criteria, why aren’t the Weasley children getting written warnings right and left? Are we seriously meant to believe that a Ministry that can tell when and where magic was performed can’t tell that a House Elf, and not an underage student, was the culprit? Then through an amazing coincidence of plotting, Ron and Harry are the very last two people to need to get through the entrance to Platform 9 3/4 to get the train to Hogwarts. Except for some reason the barrier seals itself early (Dobby is really up to no good) and they find themselves trapped on the wrong side. Now I realize they would be desperate. And I realize when you’re 12 years old desperation can feel a lot less reasonable than when you’re an adult. But what do Ron and Harry do? They steal the flying car Ron’s father had illegally tricked out and follow the train to Hogwarts in the air. Because waiting for Ron’s parents to return through the barrier and explaining what had happened would have been far too difficult. No way they could have sent an owl to the school and come up with an alternative means of transport. And because the series is named after Harry, it’s not like he can actually get in trouble for this. Nevermind that he stole an illegal flying car and left countless Muggle witnesses in towns all across England on the way to Hogwarts. Nevermind that he and Ron got the car destroyed when they crash landed in a rare Whomping Willow tree on Hogwarts grounds. Nevermind that this kind of reckless, impulsive behavior should be seen as dangerous and not rewarded or thought of as brave. Yet that is what we are asked to do. Even Ron’s father, whose job is to prevent Muggle items from becoming enchanted, manages to emerge from the scandal with only a fine. There’s a bit of cheek in Rowling’s portrayal of Arthur Weasley as a hypocrite, but since he’s also on the side of good and portrayed in such a sympathetic light, we’re meant to be relieved that he wasn’t punished for the bad deed he knowingly committed. Now I’m not suggesting that Harry and Ron should have been expelled and Arthur Weasley should have been put in prison. But the way everyone blithely shrugs off their misbehavior is a little off-putting. Heroes are fallible and make mistakes, and they should be held accountable for them. Rowling seems to be aware of this fact all too well, and yet she seems desperate for us to cheer on Harry’s reckless disregard for the rules. It’s something she clearly has a soft spot for, as seen through indelible characters like Fred and George, but it has a time and a place. Getting back to the point, on the whole Chamber is a good book, but we still aren’t quite there yet. Rowling is still teasing her way into where she wants to be. Unfortunately for Chamber, it’s good enough but stuck in that awkward transition phase. We’re done with the world-building childishness of Sorcerer’s Stone but we’re not heavy enough to be taken seriously like Goblet of Fire. Rampant silliness and plot holes like Dobby and the flying car mishap only manage to weaken the book even more. Read on for more about this installment. Or check out my Harry Potter page for more. Up next: Harry Potter and the Prisoner of Azkaban. I’ve already mentioned how problematic I found Dobby the House Elf’s plotline in this book, and although he won’t be back in Prisoner he will eventually return to the series and will end up making quite an impact on Harry Potter’s life. Here, he’s a servant of the Malfoy family who tries to stop Harry from returning to school, then attempts to get him injured badly enough that he would have to go home. Dobby ends up eternally grateful to Harry when Harry tricks the Malfoys into freeing Dobby from his servitude. Speaking of the Malfoys, we meet Lucius Malfoy, Draco’s father. Lucius was a servant of Voldemort’s who has been hiding his loyalty’s in the years since Voldemort’s disappearance. Lucius remains cautiously loyal to his former lord, seeking to help him return to power and even helping plant Voldemort’s old diary in Ginny Weasley’s possessions to that end. Lucius, and the Malfoy family, will continue to be a thorn in Harry Potter’s side throughout the series. In a brief scene, we get our first glimpse of Cornelius Fudge, the Minister of Magic, as he takes Hagrid off to Azkaban to appease the wizarding community that the Ministry is taking action on the attacks at Hogwarts (no matter how incorrect the action is). We also meet Moaning Myrtle, another Hogwarts ghost who lives in the bathroom where she died. She won’t be a big presence in the series but she’ll pop up again in Goblet of Fire to help Harry solve one of the clues for the Triwizard Tournament. Finally, we meet Dumbledore’s beloved pet Phoenix Fawkes. Fawkes won’t have the kind of spotlight he gets here again in the series, but he will remain a touchstone and a symbol for Dumbledore throughout. First of all, the circumstances of Hagrid’s expulsion from Hogwarts as a student were cloaked in mystery before. Now we know Hagrid was expelled from Hogwarts because it was believed that he opened the Chamber of Secrets. But he was framed by another student named Tom Riddle, who was the real culprit. Which brings us to the other thing we now know: Voldemort’s real name was Tom Riddle and his father was a muggle. His mother, however, was a witch and an heir of Salazar Slytherin. We also know that his backstory has similarities to Harry’s. When he was at Hogwarts he lived in an orphanage and hated going home for holidays. In fact, when Harry first gets to know Tom Riddle in Riddle’s diary before the big reveal, he feels strong sympathies for him. 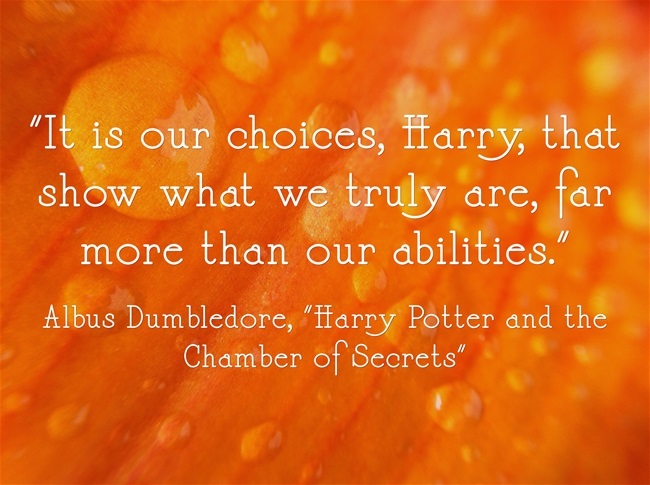 After Riddle reveals that he grew up to become Voldemort, we get our first glimpse into the overarching theme of choice that will surround Harry. Gilderoy Lockhart is a spectacular creation of Rowling’s. He is, perhaps, the first indication that this series was going to have some decidedly adult themes going on in the background for anyone who cared enough to notice them. Lockhart is a farce on celebrity, and it’s difficult to imagine a more biting satire disguised within a children’s book. He’s vain, egotistical, self-promoting, and doesn’t actually have anything worthwhile to back any of that up. Seriously, the guy is all talk. He’s created a legend around himself but he can’t do anything to back it up. People look to him to be an expert in his field, but he quite literally doesn’t know what he’s talking about. All he does is steal credit for work other people have done and look pretty in pictures. Those of you who already know and love the series well already know the additional significance of Tom Riddle’s diary. Those who don’t, here’s the lowdown in spoiler form: Voldemort secured his seeming immortality by storing pieces of his soul in objects called horcruxes. Voldemort cannot truly die until all of the horcruxes have been destroyed. Being a sentimental sort, old Voldy chose objects of sentimental value when creating his horcruxes. His diary from his time at Hogwarts was a natural choice. Harry had no way of knowing it at the time–and neither did we–but in Chamber of Secrets he encountered and destroyed the first of seven horcruxes, putting him one step closer to ultimately defeating Voldemort. Of course, technically we had already encountered a horcrux long before this because Harry himself is a horcrux (a bit of his soul having gotten tangled up with Voldemort’s on that fateful night when Voldemort failed to kill him). But we see Harry in every book, so if we point that out all the time it’ll weaken the drama. Just like the latest gadget is constantly getting replaced by a newer, shinier gadget, Harry’s fancy broomstick gets replaced by a newer, fancier model: the Nimbus 2001. And Harry doesn’t even have one. But every player on the Slytherin quidditch team does (including their new seeker, Draco Malfoy)… Super-conveniently, Professor Sprout brings in a shipment of Mandrakes for her students to study at the beginning of the school year. Why super-conveniently? Because Mandrakes, which look like normal plants from the ground but have humanoid bodies underground and can kill you with their cry, can be used to cure anyone who has been petrified. Even more conveniently for the plot, it will take exactly the length of the school year for them to mature enough, so anyone petrified will have to remain petrified until the end of the book and no longer… Harry spends a lot of time terrified that the Sorting Hat put him in the wrong house when it selected him for Gryffindor instead of Slytherin, but when Fawkes brings him the Sorting Hat during the final showdown with Riddle and the basilisk Harry shocks everyone by magically pulling Gryffindor’s Sword out of the Sorting Hat. This magical, ruby-encrusted sword–which only a true Gryffindor could have called out–will be a tool in Harry’s arsenal in the war against Voldemort throughout the series… One of the things making Harry worry about where he belongs in the world is the revelation that he is a parseltongue, or someone who can speak to snakes. Not only is that a rare power in the magical world, it’s usually a signifier of dark energy. Voldemort was the last known parseltongue, and it is likely that Harry was left with the gift as a result of their entanglement on that fateful night when Voldemort failed to kill him. For the first time, people begin to question whether or not the Boy Who Lived is all he’s cracked up to be, and wonder if he’s the one behind the attacks at Hogwarts. They’re mostly suspicious because he has a knack for being at the scene of the crime when an attack happens and he is revealed to be a parseltongue, but as time goes by and especially after Hermione becomes petrified by one of the attacks, suspicion of our boy dwindles away. So he comes away with some dings and bruises to his credibility, but all in all Harry is still widely considered a hero to everyone. Dumbledore’s legacy is even more intact than Harry’s in Chamber. Yes, he gets briefly removed as Headmaster by the Hogwarts governors–led by Lucius Malfoy–but this move is never meant to look like anything but a foolish and dangerous endeavor. Dumbledore is still the wise, noble, and powerful man in charge of Hogwarts–and no one is meant to question his methodology at this point.